Just finished a new ACEO (art cards, editions & originals) yesterday! Entitled 'Strawberry Festival', made with pen and markers. The scan's a little faded for some reason. The artwork was inspired by the Sarah Coventry vintage brooch of the same name. I bought one last week because I wanted it for so long and finally saw one with the right price!! Now to get the matching pair of earrings lol. Oh love the artwork and the brooch is darling. I can taste the strawberries. Your art is lovely! And that brooch is so yummy!! I love the ACEO. She's just so sweet! Oooh, super cute aceo! Love the brooch, too. How charming! Love the colors. It reminds me that Summer has ended! 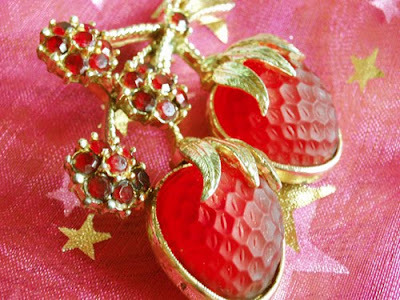 Ooh, the brooch looks like candy! And your artwork is great. I really like the girl's hair color. It compliments the strawberries well! I love this art! The brooch eye candy as well! The brooch is gorgeous, and I love the artwork too! I always love seeing your new art. This card is so cute! I love it! 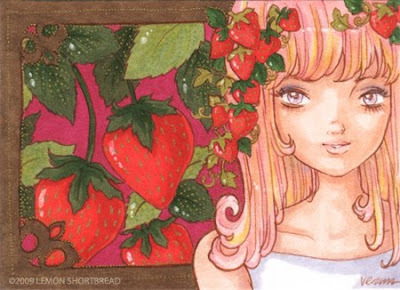 Your work is so lovely, this one with the strawberries is my favourite!